Congratulations! You have earned a maximum possible badge for recruiting volunteers! Got the highest possible recruitment badge! applejacks, skylaar24, ChristianVirtual and 4 others like this. McCHillin, applejacks, Gilthanis and 1 other person like this. Smash Childhood Cancer has reached Sapphire. applejacks, Skillz, Gilthanis and 1 other person like this. McCHillin, fastgeek and Skillz like this. fastgeek, Gilthanis, ChristianVirtual and 1 other person like this. fastgeek, ChristianVirtual, applejacks and 1 other person like this. fastgeek, Skillz and Gilthanis like this. McCHillin, fastgeek, motqalden and 2 others like this. ChristianVirtual, fastgeek and motqalden like this. Just got 1 yr emerald for mapping cancer markers. ChristianVirtual, fastgeek, Skillz and 1 other person like this. Am working on my first century badge... shouldn't be too much longer. ChristianVirtual, Skillz, motqalden and 1 other person like this. fastgeek, ChristianVirtual, Gilthanis and 1 other person like this. Mapping Cancer Markers has reached Diamond 50.
motqalden, phoenicis, Gilthanis and 1 other person like this. Due to shifting loads, this took a little longer than I hinted at earlier, but it finally happened... my first Century badge at WCG! FA@H-P2 has reached Diamond 100.
applejacks, motqalden, ChristianVirtual and 2 others like this. So are there any badges above 100? I thought that there weren't but I keep forgetting. To the best of my knowledge, no, once you get to 100 there aren't any additional badges. That's correct. 100 is the highest. Those bums. Fine, I will make my own. 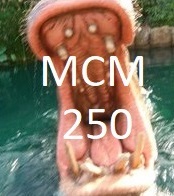 MCM reached "CPU Hippo" 250 years! [Ion], motqalden, ChristianVirtual and 2 others like this. [Ion], applejacks, motqalden and 1 other person like this. Skillz, motqalden, phoenicis and 4 others like this. I get dizzy seeing that list; nice work ! Thanks! Eight and a half years and discount second-hand servers do wonders. Currently sitting on about 850 (=>~450 CPU cores, since most are HT-enabled Xeons) threads running 24/7. Make your own, lol. 1000 certainly deserves an epic one! [Ion] and fastgeek like this. The overwhelming majority of what I'm running is Xeon E5 Linux systems. Each time they release a new project I do some benchmarking to see what runs best there, and for the past while it's been OET (Vina seems to run VERY well on LInux64). I figure there's no reason not to let me computers work to their relative advantage most of the time, so OET it is. Holy ****, [Ion] , that's amazing! Guess we now know who to blame if there's ever a OET WU shortage. Speaking of OET, mine ticked over to a (comparatively puny) Diamond 50 a couple days ago. applejacks, [Ion] and phoenicis like this. Hit 125 years Total Run Time today. Holy carp who is Ion??? motqalden and ChristianVirtual like this. [Ion] the best team was posted above for your convenience. phoenicis, motqalden, [Ion] and 1 other person like this. Century badge #2 for OpenZika popped up a few days ago... I'm a slacker. phoenicis, applejacks, pututu and 1 other person like this. Last milestones for now. I'm in the process of selling off old hardware. Might add a Ryzen 7 box in a few months. Athlon x4 640 is the next to go. Having trouble selling it locally on CL. Sold a Dell i3-550 box a couple weeks ago. Need to install Win 10 on the Dell i5-3330 box and transfer all the family stuff from the Dell E7500 box. Then the Dell E7500 box will go. That's going to take some time. Possibly later this year. EDIT: Sold the Athlon II x4 640 box tonight. Will be running only 12 cores temporarily. Hit 25 million BOINC points today. Will hit 10 years WCG crunching soon --> 4/17/2008. ChristianVirtual, Gilthanis and motqalden like this.